Come nurture yourself and your baby. We provide the country’s first sanctuary to offer yoga and more for every stage of your pregnancy and your infant’s life, with Prenatal Yoga classes offered every day and weekly Postpartum classes to enjoy this special time with your child. Experience this wondrous time of your pregnancy more profoundly by learning how to be with your growing body and baby more consciously, in ways that build physical and mental strength and flexibility. 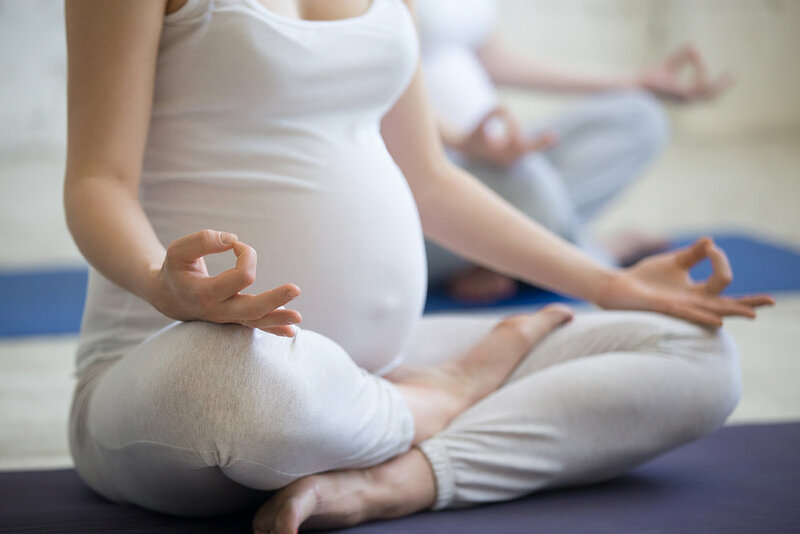 In addition to deepening your body-mind-spirit connection to yourself and your baby, our Prenatal Yoga class helps you more easily manage the discomforts of pregnancy and maintain wellness as you prepare for childbirth and embark on the joyous journey into motherhood. Please eat a light snack at least one hour before class to maintain normal blood sugar levels. Herbal tea and filtered water is also available for you in the studio. This class is for women only (rate charged per woman). Whether you’re preparing for pregnancy, or in your first to third trimester, our prenatal class is safe and gentle for everyone. No previous yoga experience needed. Offered every day of the week! Rate includes one adult with baby. No extra charge for twins. Mothers love the physical and emotional support this class offers. Gentle yoga poses are taught to help you strengthen, energize and tone while deepening your sense of well-being. The movements are individualized to your needs and designed to be safe for moms and babies, especially postpartum mamas whose bodies naturally need extra support as they recover from the stresses of pregnancy and childbirth. We focus on aiding specific areas such as neck, shoulders and lower back, as well as building strength for your abdominal area and pelvic floor. Together we also offer each other emotional support and share parenting tips. Discussions are held on feeding your baby, newborn/infant care, infant/child development and postpartum recovery. We invite you to come to class when you feel ready. If you are breastfeeding, you can more comfortably do so surrounded by only women and babies during this hour. Rate charged per woman. Men/other adult genders are welcome to attend our other parent/baby classes, like Baby & Me Yoga, Mommy/Daddy & Me, Baby Gym, Toddler Gym and Infant Massage. Baby, let’s rock and roll! Move to the beat of lively music with exercises designed to help your baby’s growing mind and body during this incredibly influential time of brain development. Babies delight in loving skin-to-skin contact with mom and/or dad, being held and carried, and spending tummy time on your body, all which help stimulate your infant’s nervous system and aid physical and cognitive development. Your baby gains more control and coordination while increasing strength, agility and flexibility for a beautiful foundation to grow on—and is likely to sleep more soundly, too! Rate includes up to two adults and one child. Infant massage is one of the most rewarding and loving activities you can share with your baby. At Sri Janani Yoga, you learn a full-body massage sequence based on ancient, timeless Ayurveda massage techniques, accompanied by specific baby-movement exercises and playful songs that are fun for you and your baby. This wonderful combination helps to develop your infant’s brain and nervous system, improve visual acuity and stimulate the senses. Please bring an extra blanket, or soft towel or two, for your baby to keep warm and comfortable during the massage. Since we’ll be working with oil for the massage (complementary), an everyday blanket is best, rather than your treasured heirloom. You can attend one class or more. If you miss a class during the series you can make it up in another session. Rate includes parent and baby; spouse/partner welcome at no extra charge. A handout of techniques is given for your home practice. We come together in this special gathering to help our pregnant sisters feel nurtured, heard, supported and nourished through sharing a nutritious vegetarian lunch, stories, a talking circle, meditation and more. As supporters we are grandmothers, mothers, sisters, aspiring midwives and professional midwives, doulas, nurses, doctors, yoga teachers, psychiatrists, pharmacists, energy and body workers, ministers, and other women who care deeply about simple and sacred birth; we gather out of selfless service to support and encourage the instinctual life of those with us wanting to birth in power against a modern current of fear and unnecessary interventions. For all who wish to come, please email Colette, who is organizing the shared lunch: colette@seattleholisticcenter.com. If you want to bring a beloved elder woman in your life please do! We only ask that she email Colette and arrange to bring a potluck dish to share, along with the other elders and supporters in our gathering. Held approximately every trimester (three times per year). Mia Edidin is a Licensed Independent Clinical Social Worker in Seattle with a private practice in Wallingford. Mia has worked with families for more than 15 years. She primarily works with new parents, specializing in pregnancy and postpartum emotional adjustment, attachment, and relationship difficulties. In addition to her clinical work with families, Mia is the Director at Perinatal Support Washington—a statewide nonprofit focusing on perinatal mental health. For more information about her, please visit MiaEdidin.com. This new mom support group offers additional support for the emotional changes and challenges of adapting to parenthood. Becoming a new parent can be overwhelming, and it often takes time to adjust to changed roles and unfamiliar experiences. Good support can help ease the transition, especially if it provides a place for new mothers to come together and express the reality of how difficult parenthood can be. Adjusting to Parenthood is a place for women to feel heard and be honest about the highs and lows of motherhood. It offers a supportive environment in which the full range of postpartum experiences is welcomed and the everyday realities of being a new mom are understood. Rate is charged per adult. To learn more information about the Seattle groups, please email mia.edidin@perinatalsupport.org or call (206) 659-7773.